For the first time in more than 30 years, more people voted for the candidates for governor in Washington than for the listed candidates for president. The unusual turnout numbers are likely a result of unpopular presidential candidates in an uncompetitive race in Washington. Perhaps you noticed: There was quite a bit of attention on the presidential race before Election Day. The race for governor in Washington state was, comparatively, a little sleepy. And yet, for the first time in 32 years, more Washington voters cast their ballots for candidates for governor than for candidates for president. This year marks only the third time in eight decades that there were more votes for the gubernatorial candidates in Washington than for the presidential ones. 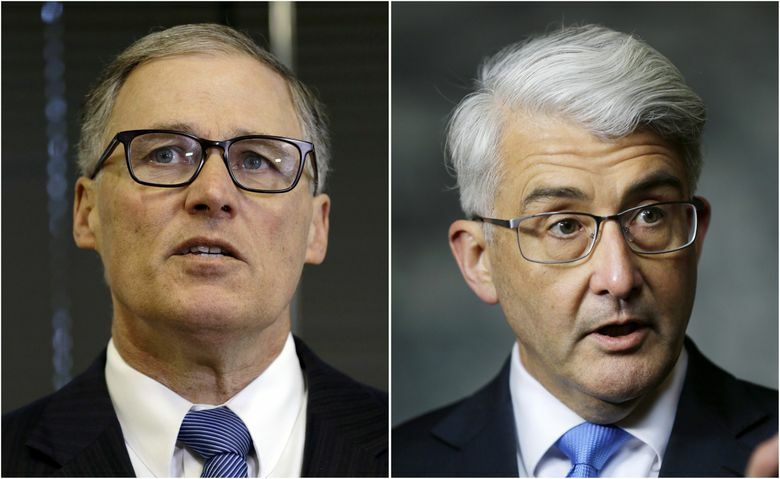 As of Wednesday afternoon, with nearly 79 percent of ballots returned, there were about 23,000 more votes for gubernatorial candidates Jay Inslee and Bill Bryant than there were for Donald Trump, Hillary Clinton and the five minor-party presidential candidates on the Washington ballot. Not since 1984, when Ronald Reagan won 49 states in an electoral landslide, have more Washington voters cast a ballot for candidates for governor than candidates for president. Before that it hadn’t happened since 1972, when Richard Nixon was re-elected in the midst of the Watergate scandal. One caveat: There were an unusually large number of write-in votes for president in Washington this year, more than 78,000 so far, possibly a result of the write-in campaign of conservative Evan McMullin. When those are included, the number of presidential votes edges past the gubernatorial total. But it wasn’t just the governor’s race that drew more votes than Clinton-Trump and the other listed presidential candidates. There were also more votes cast on ballot initiatives raising the minimum wage and limiting access to guns, than there were for the presidential candidates. Presidential races tend to get more votes than governor races, which get more votes than lieutenant governor races, and so on. Both Lovell and Elway speculated that Clinton and Trump’s unpopularity, and the vicious nature of the campaign, led some voters to abstain. One of those voters was Russell Thomas, 44, of Seattle, who filled out his entire ballot, save for the presidential race, which he left blank. “It was really a protest vote, to say to both parties that we didn’t like the options we were given,” Thomas, a supporter of Vermont Sen. Bernie Sanders, said. Thomas said that he preferred Clinton to Trump, but he has no regrets about his vote, since the state was all but certain to go to Clinton. If he lived in a swing state, he said, he would have voted for Clinton. But the same trend is visible in a couple of swing states that helped tilt the election. In Wisconsin, for instance, which went to Trump by 1 percentage point in perhaps the biggest surprise of election night, more people voted in the competitive U.S. Senate race than in the presidential race. Michigan, which went for Trump in another surprise, didn’t have a high-level statewide race (governor or senator) on the ballot. But nearly 88,000 voters, almost 2 percent of people who cast a ballot, did not cast a vote for president. That number dwarfs Trump’s margin over Clinton in Michigan, which was just over 13,000 votes. And in New Hampshire, which Clinton won by about 2,700 votes, the U.S. Senate race got about 6,200 more votes than the listed presidential candidates did. In Washington, nearly 79 percent of registered voters have returned their ballots, a number that will likely rise slightly before the deadline for certifying votes Nov. 29. But it may not match the 81 percent who voted in 2012 or the 84 percent in 2008. In a race between one candidate who embodied a D.C. establishment that voters had clearly tired of, and another candidate who proposed a religious test for immigrants and was caught bragging about assaulting women, some voters were just turned off.